FALUN GONG | COURAGE FOR AMERICA! Hong Kong is making Beijing feel jittery, with the Falun Gong and other groups wanting to practice their spirituality or beliefs– without the interference of the Communist Party in Beijing. 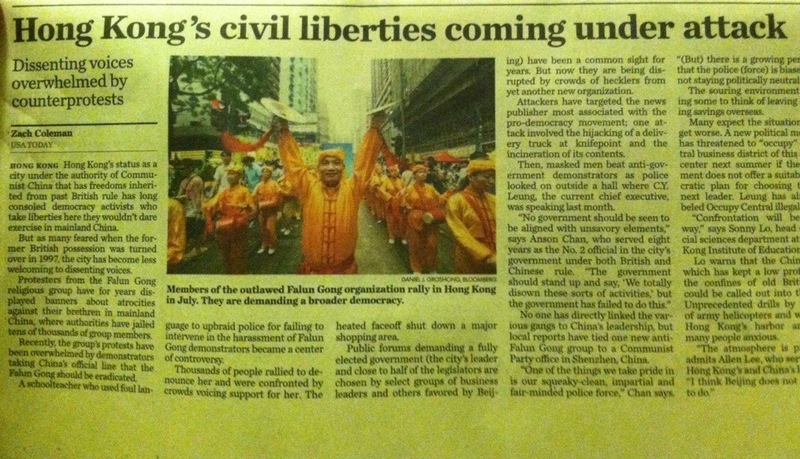 Others are taking their money out of Hong Kong, for fear of increasing control by the Chinese government. The pro-democracy movement in Hong Kong is being strongly pushed back by the Communist Party’s top local representative, Zhang Xiaoming, who has stated that any system of universal suffrage in Hong Kong will have to abide by Hong Kong’s “basic law” (constitution)– and that an open nomination of candidates will be rejected.